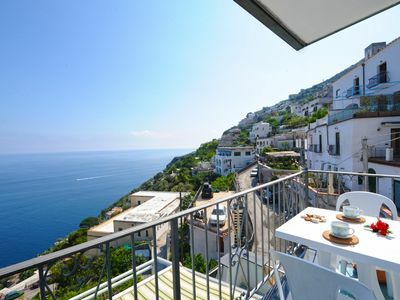 This self catering apartment is situated in the upper central part of Praiano, away from the busy main arterial road of the Amalfi coast. Moressa has recently been renovated with taste and style. It has a well equipped and efficient kitchen with oven; ideal for a family trip. The apartment comprises of one matrimonial bedroom, one bedroom with two single beds, two bathrooms (both with shower box), a large living/dining room with a sofa. Moressa apartment has two big terraces; one as you enter the apartment, and the main one located in front of the rooms where you can enjoy the magnificent view of the coast. 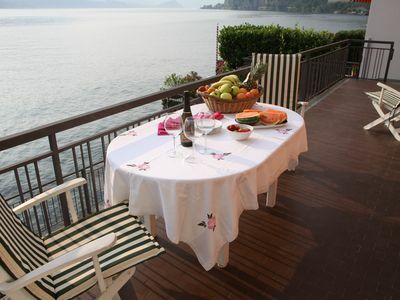 The main terrace is equipped with a table and chairs, as well as two sun beds and a sun umbrella. The apartment is close to a grocery shop offering a food delivery service. The beach of La Praia (shown in one of the pictures) is just 15 minutes walk away. It can be reached by steps or by the public bus service that loops Praiano and Positano. This bus service runs in spring and summer and part of the autumn period and connects Praiano with the centre of Positano until late at night. The apartment has a convenient private garage which can be used at a tariff of Euro 10 a day (to be booked in advance to avoid disappointment). Reverse air conditioning / heating in the main bedroom (that cools/heats partially the other area of the apartment). 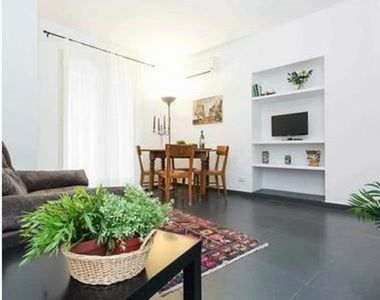 Palermo, art, culture and nature "BLUE APARTMENT"